Martin Ludwig Bormann (17 June 1900 in Halberstadt – 2 May 1945 in Berlin) was a German politician and member of the Nazi Party. He was the private secretary of Adolf Hitler. He was also a member of Hitler's Cabinet. In 1923, he took part in the Munich putsch. At this time, he became one of Hitler's closet advisors. Because he took part in a murder, he was convicted to one year in prison in 1924 by the German Staatsgerichtshof. In May 1941, he became a Reichsminister. This was because Rudolf Hess' flight to Scotland. In 1943, he became Hitler's private secretary. At the Nuremberg Trials, Bormann was convicted to death in 1946. This happened while he was not there. 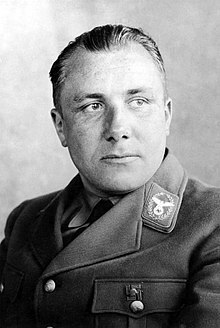 Wikimedia Commons has media related to Martin Bormann. This page was last changed on 29 September 2017, at 08:41.